Foot assessment is a common approach in clinical practice for classifying foot type with a view to identifying possible aetiological factors relating to injury and prescribing therapeutic interventions. This approach is underpinned by a contextual model of the foot whereby structural alignment, or position of the foot, is used to infer characteristics of dynamic foot function, and theoretically establish injury mechanisms leading to pathology. This model of foot function is primarily derived from the work of Root et al who proposed static assessment measures to enable clinicians to identify deviations from an ideological ‘normal’ foot. A large variety of methods have been developed to classify the foot based on structure and alignment. These methods include radiographic measurements, qualitative and semiquantitative visual appraisal, anthropometric measurements, footprint analysis and analysis of captured images Barnes and colleagues suggested that quantitative measures of foot alignment were superior to a qualitative classification, based on better reliability. However, some researchers identify that observer subjectivity and bias may undermine the accuracy of these qualitative appraisal tools. The lack of strong consensus between measures for foot classification underpins the need for a consensus on appropriate clinical measures of foot structure. Radiographic evaluation is the widely accepted gold standard for assessing foot and medial longitudinal arch alignment but there is currently no study that has validated visual/physical assessment approaches with radiographic measurements. Forefoot Varus - This foot spends too much time in the shock absorbing phase and converts to propulsion late. Symptoms include superficial knee pain, shin pains, Achilles tendonitis, I-T band pain, plantar fascitis, low back pain, etc. Orthotic treatment include orthotics that trick the foot into thinking it's down to the ground by bringing the ground up to the forefoot. Rearfoot Varus - This foot functions the same as Forefoot Varus when found with a Forefoot Varus. However, it functions like a Valgus foot when found with a Valgus Foot. Orthotic treatment is with an orthotic with rear foot control. Rigid Forefoot Valgus - This foot prematurely converts to propulsion at a time when it should still be absorbing shock. Symptoms include a tendency to ankle sprains, an unsure gait, every foot pain imaginable, leg muscle problems, stress fractures, etc. Orthotic treatment includes an orthotic that tricks the fore foot into thinking all the bones are level with each other by bringing the ground up to the foot. Very rare foot type. Flexible or Plantar Flexed First Metatarsal - This is the hardest foot type to classify. It is capable of functioning like a Forefoot Varus, Rearfoot Varus, and in some cases, like a Rigid Valgus, but not as severe. Symptoms include everything including sciatica. Orthotic treatment is with orthotics to put the forefoot in neutral. It is a clinical tool used to quantify the degree to which a foot is pronated, neutral or supinated. It is a robust measure and reliable means of static foot assessment and offers a more valid approach to assessing static foot structure. A series of six observations and palpation are made by clinician and each measure is scored from -2 to 2. A total score of 0 is considered a neutral foot, a positive score is for pronated foot whereas supinated foot is given negative score. For scoring patient stands in double stance position and is asked to stand still. Following table describes the scoring criteria of FPI taken from Lee et al. No lateral toes visible. Medial toes clearly visible Medial toes clearly more visible than lateral Medial and lateral toes equally visible Lateral toes clearly more visible than medial No medial toes visible. Lateral toes clearly visible. The MLAA is robust uni-planar measure with a higher level of reliability, good agreement within measure for foot classification and broader foot classification boundaries. A line is drawn from center of medial malleoli to navicular tuberosity and another line is drawn from navicular tuberosity to head of first metatarsal. The obtuse angle between these lines is known as LAA. The normal maximum LAA is between 1310 and 1520. 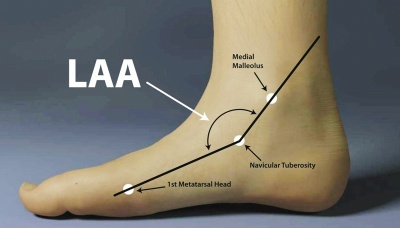 Foot with lower LAA is considered to have low-arch and angle greater than 1520 is considered to be high-arched. Feiss line is drawn from center of medial malleoli to head of 1st metatarsal. If it is high arch the navicular tuberosity is above the arch and in low-arched foot the navicular tuberosity is below the line. The navicular drop test is a measure to evaluate the function of the medial longitudinal arch, which is important for examination of patients with overuse injuries. Conflicting results have been found with regard to differences in navicular drop between healthy and injured participants. Normal values have not yet been established as foot length, age, gender, and Body Mass Index (BMI) may influence the navicular drop. Langley et al report that it is not an acceptable measure for characterising the foot. Four locations are palpated and marked using a skin marker pen. These are: (1) the base of the calcaneus; (2) the Achilles tendon attachment; (3) the centre of the Achilles tendon at the height of the medial malleoli; (4.) the centre of the posterior aspect of the calf 15 cm above marker three. The RFA was measured using a goniometer. The arms of the goniometer were aligned with the line connecting marker one and two (line 1) and the other arm with the lines connecting marker three and four (line 2). The RFA is measured as the acute angle between the projection of line one and line two. RFA ≥ 5° valgus represents a pronated foot type, 4° valgus to 4° varus a neutral foot and ≥ 5° varus a supinated foot. To measure internal or external tibial torsion, patient is positioned in prone lying with knees flexed to 90o. A thigh-foot ankle (TFA) is measured between the line bisecting the posterior thigh and another line bisecting the foot. Normally the angle is between 0o to 30o, TFA more than 30o is excessive external tibial torsion and TFA less than 0o is considered internal tibial torsion. It is the position in which the foot is neither pronated nor supinated. STJN acts as a reference point for STJ PROM and for lower extremity measurements. It is also the position which is used for orthosis fabrication and casting. To find STJN in OKC patient is in prone lying with the foot to be measured off the plinth and other lower extremity in the position to make a “4”. The talus is palpated between the thumb and index finger, and the forefoot is moved gently into supination-pronation to the point where medial and lateral aspect of talus are palpated equally on both sides. The foot is then moved into slight dorsiflexion until a soft end-feel, this is STJN position. For OKC measurement, once the STJN is established the angle between the line bisecting calf and another line bisecting calcaneus is taken. Normally the calcaneal angle is in 2o to 8o of varus/inversion. For CKC measurement, patient is standing on a box in unilateral stance position with support for balance. The talar dome congruency is palpated and the joint is place in STJN. The angle between the line bisecting the calf and the line bisecting the calcaneal is taken in this position. The relationship of forefoot to rearfoot is measured to quantify forefoot varus or forefoot valgus. To measure the relationship, patient is prone lying with figure ‘4’ position for non-examined lower extremity. Once the STJN is achieved the relationship of forefoot to rearfoot is observed. The stationary arm of the goniometer is place perpendicular to line bisecting calcaneus with fulcrum on the point bisecting calcaneus. The movable arm of the goniometer is placed parallel to imaginary line passing through metatarsal heads. Forefoot angle of 0o is considered neutral, whereas positive degree is forefoot varus and negative degree is forefoot valgus. AHI is used to measure medial longitudinal arch and based on which foot can be categorized into high-arched, normal and low-arched. 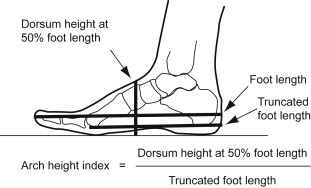 Williams & McClay compared various foot measurements and ratios, and came up to the conclusion that height of dorsum of foot at 50% of foot length divided by truncated foot length was reliable and valid measure to determine AHI. A caliper and a graph-sheet can be used for the measurement. Patient is in standing position and caliper is used to measure foot length, height of the dorsum of the foot at 50% of foot length and truncated foot length as shown in the image. If the ratio is 0.356 or greater the foot is considered high arched, and ratio of less than or equal to 0.275 is considered a low-arched foot. Description of arch mobility can be assessed by having AHI taken at 10% and 90% of body weight. Arch Rigidity Index (ARI) is also been suggested which is calculated as standing AHI/sitting ARI and it can offer a valid and reliable alternative to navicular drop test. For measurement of 1st MTP fulcrum of goniometer is placed on the medial aspect of 1st MTP joint axis. Stationary arm is parallel to the floor and movable arm is parallel to the proximal phalanx of great toe. Normal ROM for flexion is 0-45o, and for extension is 0-70o. Normal ROM for lateral four MTP flexion is 0-40o, and lateral four MTP extension is 0-40o. Normal ROM for great toe IP flexion is 0-90o, and great toe IP extension is 0o. Normal ROM for lateral four PIP flexion is 0-35o and PIP extension is 0o. And normal ROM for lateral four DIP flexion is 0-60o and extension is 0-30o. Barefoot running has gained popularity within the running community. Many runners have been inspired by the 2010 book by Christopher McDougall, 'Born to Run'. There is limited supporting evidence for barefoot running to prevent injuries but the practice remains popular. During assessment, a clinician may ask their client to remove footwear so they are able to gain better appreciation of the biomechanics or gait. With some runners choosing to run barefoot and clinical scenarios where a client may be barefoot, it is important to consider any biomechanical differences between the two styles of running. In 2014, Hall et al. published a systematic review to evaluate biomechanical differences between running barefoot and shod, in Sports Medicine. Evidence quality was moderate at best and they report reduced peak ground reaction force is reduced, increased foot and ankle plantarflexion and increased knee flexion at ground contact compared with shoe running. The medial longitudinal arch acts as a 'shock-absorber' and is important in generating force for the propulsion phase of gait. From the middle age there is a gradual reduction in the height of the arch which manifests as greater medial contact of the midfoot. as well as higher FP1-6 scores. It is unclear why these changes occur to the adult foot but the prevailing thought is that degenerative changes and deconditioning to the tibialis posterior muscle and tendon is the most common reason for older adults with flat-feet. ↑ 1.0 1.1 1.2 1.3 1.4 1.5 Langley B, Cramp M, Morrison SC. Clinical measures of static foot posture do not agree. Journal of Foot and Ankle Research. 2016 Dec 1;9(1):45. ↑ 2.0 2.1 2.2 2.3 Tong JW, Kong PW. Association between foot type and lower extremity injuries: systematic literature review with meta-analysis. journal of orthopaedic and sports physical therapy. 2013 Oct;43(10):700-14. ↑ 4.0 4.1 Lee JS, Kim KB, Jeong JO, Kwon NY, Jeong SM. Correlation of foot posture index with plantar pressure and radiographic measurements in pediatric flatfoot. Annals of rehabilitation medicine. 2015 Feb 1;39(1):10-7. ↑ Nilsson MK, Friis R, Michaelsen MS, Jakobsen PA, Nielsen RO. Classification of the height and flexibility of the medial longitudinal arch of the foot. J Foot Ankle Res. 2012 Feb 17;5(3). ↑ Stuberg W, Temme J, Kaplan P, Clarke A, Fuchs R. Measurement of tibial torsion and thigh-foot angle using goniometry and computed tomography. Clinical orthopaedics and related research. 1991 Nov 1;272:208-12. ↑ 12.0 12.1 12.2 Buchanan KR, Davis I. The relationship between forefoot, midfoot, and rearfoot static alignment in pain-free individuals. Journal of Orthopaedic and Sports Physical Therapy. 2005 Sep;35(9):559-66. ↑ Williams DS, McClay IS. Measurements used to characterize the foot and the medial longitudinal arch: reliability and validity. Physical therapy. 2000 Sep 1;80(9):864-71. ↑ McPoil TG, Cornwall MW, Medoff L, Vicenzino B, Forsberg K, Hilz D. Arch height change during sit-to-stand: an alternative for the navicular drop test. Journal of foot and ankle research. 2008 Jul 28;1(1):3. ↑ Creighton DS, Olson VL. Evaluation of range of motion of the first metatarsophalangeal joint in runners with plantar faciitis*. Journal of Orthopaedic and Sports Physical Therapy. 1987 Jan;8(7):357-61. ↑ Picciano AM, Rowlands MS, Worrell T. Reliability of open and closed kinetic chain subtalar joint neutral positions and navicular drop test. Journal of Orthopaedic and Sports Physical Therapy. 1993 Oct;18(4):553-8. ↑ Mcdougall C. Born to Run: The Hidden Tribe, the Ultra-Runners, and the Greatest Race the World Has Never Seen. 1st ed. Profile Books; 2010. ↑ Altman AR & Davis IS. Prospective comparison of running injuries between shod and barefoot runners. British Journal of Sports Medicine. 2016;50(8):476-480. ↑ Hall J, Barton C, Jones P, Morrissey D. The Biomechanical Differences Between Barefoot and Shod Distance Running: A Systematic Review and Preliminary Meta-Analysis. Sports Medicine. 2013;43(12):1335-1353. 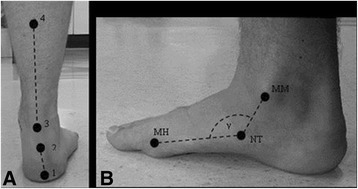 ↑ Redmond AC, Crane YZ, Menz HB: Normative values for the Foot Posture Index. J Foot Ankle Res 2008; 1: 6.